BERLIN - Restrooms on the CTrail Hartford Line trains reopened Monday after the Federal Railroad Administration reversed its mandate that they be closed for not meeting accessibility standards. That mandate was handed down earlier this year after two complaints alleged that it was discriminatory to offer non-accessible restrooms on trains to people who were mobility impaired, according to an FRA letter provided by the Connecticut Department of Transportation, which operates the CTrail Hartford Line. Mobility-impaired people could use portable restrooms at the stations. Title II of the Americans with Disabilities Act prohibits public entities, including Amtrak, from discriminating against people with disabilities, the letter stated. All public entities are required to provide reasonable modifications if needed by an individual with a disability to enable them to participate in the activity, unless an undue financial and administration burden is created by the modifications, a a fundamental alteration of the program or activity. The reversal came after a complaint was made by a sufferer of Crohn’ss disease who may need sudden restroom access. A study also determined that at least one person with a condition that might require immediate access is likely to be on any given train. “The interests of passengers who have mobility impairments who cannot use the existing restrooms must be balanced with those who need access to a restroom because of their disability,” the FRA attorney stated. “The FRA considered a number of alternatives, including providing restroom access only upon request, but concluded it would be most appropriate to modify its order and allow CTrail to keep one non-accessible restroom open for public use,” the letter continued. The complaint of the person with Crohn’s disease asked that all restrooms be unlocked, but the FRA concluded that a balanced approach would be more appropriate. As a result, the FRA is requiring one restroom on each train be unlocked and the remaining restrooms remain locked until one restroom per train is modified to comply with the ADA regulations, the letter stated. The first conversion is expected to be completed in December, CTDOT said, with the three remaining conversions expected to be completed by mid-2019. Fully ADA-accessible, portable restrooms installed at the stations in Berlin, Meriden, Wallingford, Windsor and Windsor Locks will remain as the modifications on the trains are made, CTDOT said. 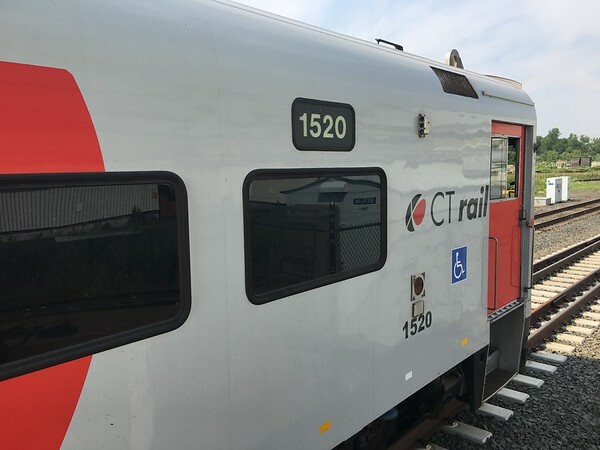 The CTDOT has said its trains were approved by the FRA at first before the administration decided to reverse that decision and close all the bathrooms. Posted in New Britain Herald, Berlin on Thursday, 16 August 2018 21:14. Updated: Thursday, 16 August 2018 21:16.